Anyone who knows me should know I have it pretty good when it comes to gaming. At our Monday group we just finished a Shadowrun campaign and are now doing classic Star Trek. On Wednesday I'm in our weekly Gamerstable gaming podcast and we're gearing up to do a Shadowrun actual play record followed by 5th Edition Princes of the Apocalypse. Then on Sunday we're currently finishing up 5E Rise of Tiamat. Once any of those are finished I could conceivably jump back into the DM's chair. My first inclination is to return to my ongoing Sea Princes franchise of campaigns which has only been 3.5/PFRPG rules. In the event I feel like trying out running 5E however, I have an urge to try converting a module or two. My favorite option so far is a rework of Five Shall Be One and Howl From the North. These 2nd Edition modules were the lead up to the Greyhawk Wars and From the Ashes era by Carl Sargent. The quest for the five Blades of the Corusks is a worthy goal especially for a game group of five. The last time I ran this series, for whatever reason, my friend played all five heroes and it went well enough, even though the ending was a huge letdown (no spoilers). 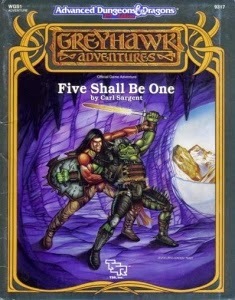 Back then the two of us enjoyed it and spun more stories from the published material, but with a new edition and a few new eager players, I'd really like a do-over of Five Shall Be One. It's also mainly because I know I can rewrite it to be better than the original. For those not familiar, the adventure is set in and around the mountainous Thillonrian peninsula in the northeast of the Flanaess. By chance a search is started for the lost swords of five renowned heroes of the north which are the only thing that can help free the Great God of the North and unite the barbarian nations together into one force to be reckoned with. With some tweaking I believe I can expand the scope of the quest beyond the corner of the map, create some more riveting adversaries and without a doubt give the players a climatic story that doesn't fall flat at the end. My first concern however is whether or not to tailor character classes and alignments to the blades in the story. The original mods came with pregen characters for this reason. I may try to leave it open-ended on who can use what blade though making characters native to some part of the north would seem a prerequisite as well. My second concern is that FSBO was made for character levels 7-9. I used to routinely start campaigns at 5th level, but since 3e I prefer to allow players to enjoy the entire career of their character. This of course means I need to run a lead in adventure to FSBO and/or else dial back the module to at least levels 4-6. That shouldn't be too hard. If I don't end up running this campaign I still intend to convert the five Blades of Corusk to 5E someday. Until next time! I've got an outline for a module that picks up the narrative thread with the PCs finding a hidden shrine of the real Vatun and freeing him. Always thought that even though these modules weren't so great, they could still yield some good narrative fruit. Excellent. You're always thinking Joseph! It says on Wikipedia that there was supposed to be a third part to the quest which was folded into Greyhawk Wars' narrative. Whatever that was I have clue. I felt like the barbarian angle was completely dropped after Howl From the North. Sorry I couldn't find your email so I thought I would ask in the comments, my name is Andrew L Kolodziej and I run a blog called www.thedailyrpg.com and was wondering if you might be interested in exchanging links with me. Thanks.